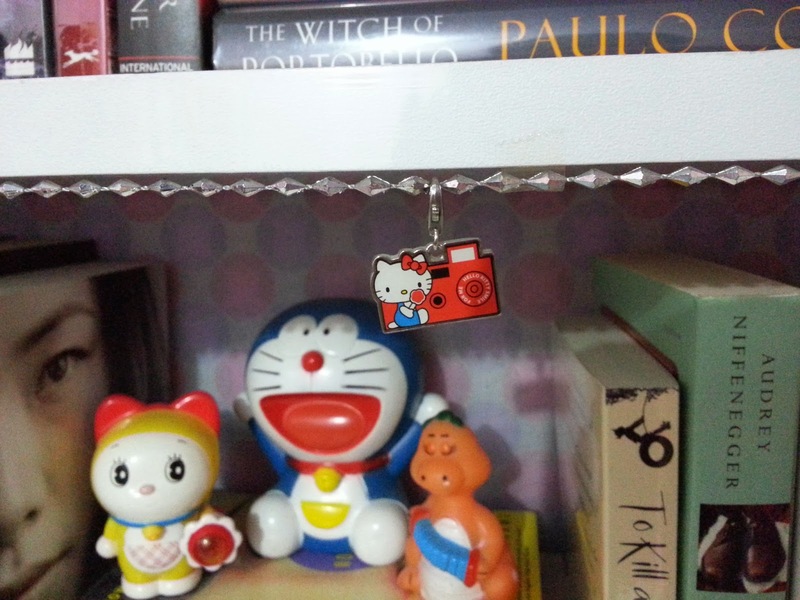 Time to Decorate Your Room with Books! Thinking to be in the middle of some space that brings you comfort, positive intuition, emerging creativity? That should be either your bedroom or work place. Well, everywhere in your house or office...anywhere you spend most of your time daily should be cozzy, well-designed, reflecting good mood and have fresh aura. 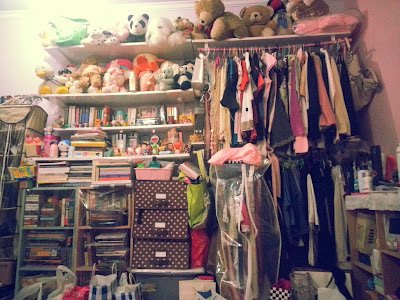 And here I'm talking about nerdy habit shouldn't always end up with messiness. If you have something specific, or, even random interest like I do, make it great. 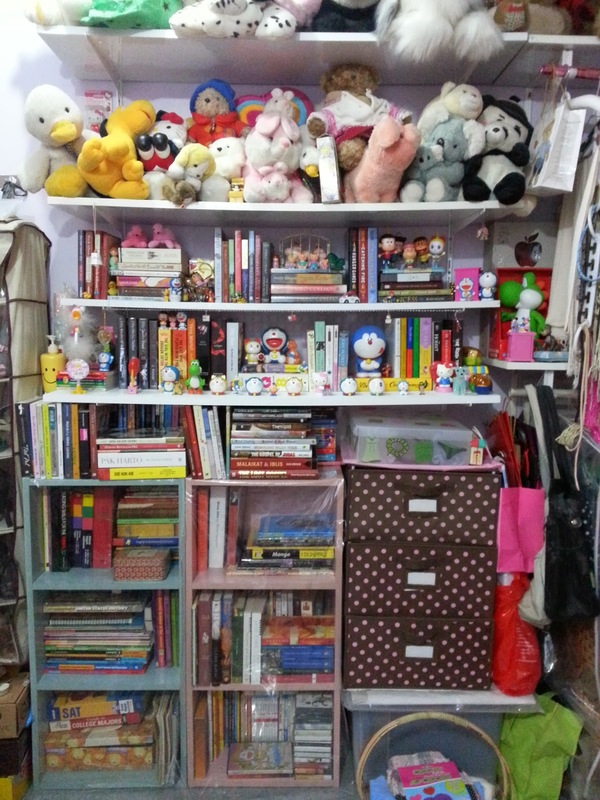 It's time to tidy your room up and show off your loves! Messed up? Yes! Firstly my books and anything slipped in them are nicely arranged. By the time goes by, more books arrived, more action figures and die cast cars joined us, and my portfolio magazine added up. Then, everything started to go uncontrolled. 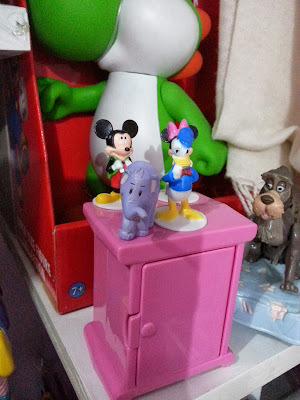 On this blogpost, I'm only sharing how it all ends with happy family of so-called Nerd Collaboration Realm. 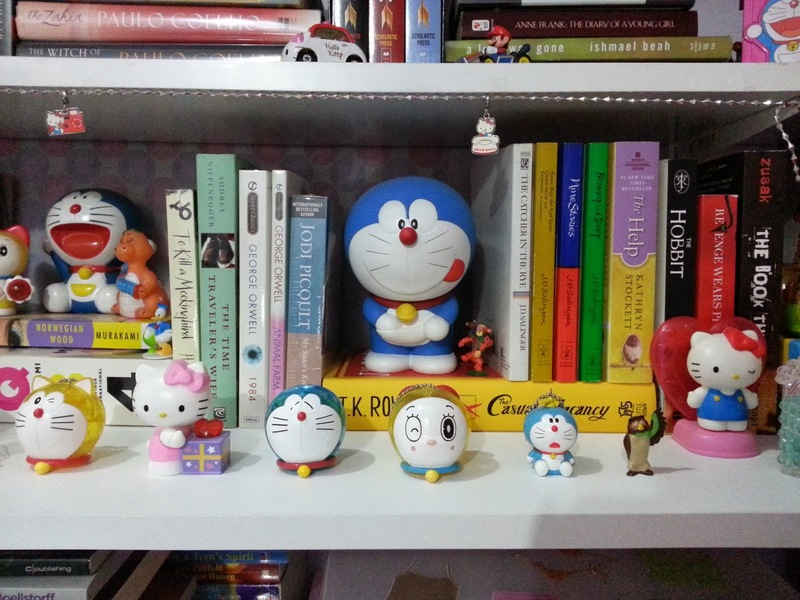 Books, die cast and action figures. The thing about books are...not only they bring so many things indescribable to us, readers, but they actually are great decor! Many book covers are pretty attractive that you are willing to pick one and find out what it is about, right? What's next? It is easily guessed: it drives you to buy. 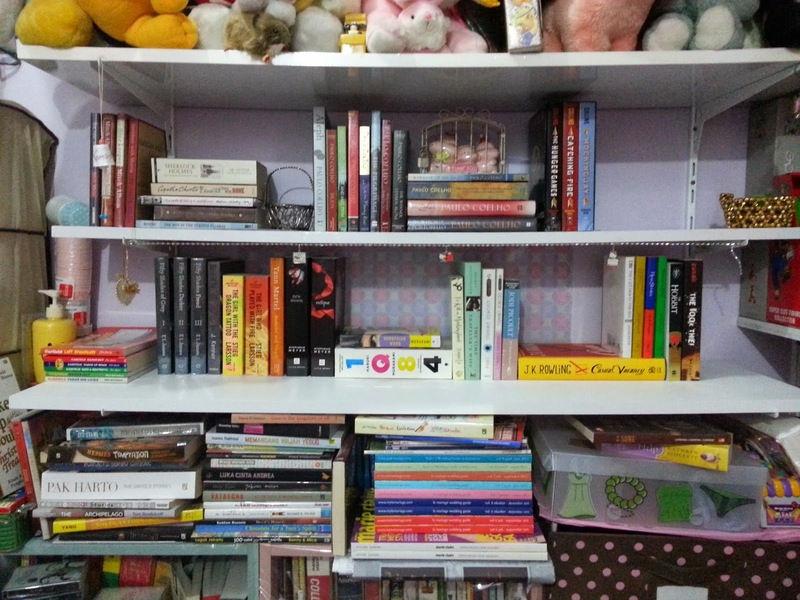 But because of the beauty, we're confused on deciding how we want it to be arranged in our shelves. Creating a row of books by their heights, colors, titles? Well books are not clothes. Place the book in order so you can find the book you're looking for in a minute, or less. Maybe you can try by put them alphabetically by first name or last name of the author, alphabetically by title, or putting them in categories by genre or publishers. Any way you want so those rows can be piled up beautifully. Don't push them too much so the books are squeezed in the shelf. Remind yourself, you need to breathe, so do your books. Give them some space to show their beauty. 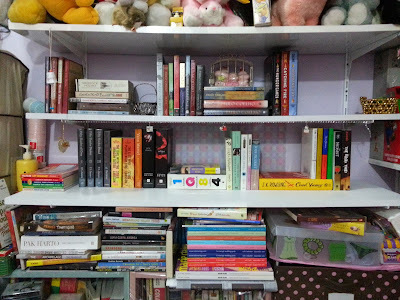 Try to have some books standing, and some other leaning on other (heavier) books like hard cover ones maybe. For other alternative, you can try by placing the books lying down. But don't put too many books. 2-3 for frequent pick up ones (like Encyclopedia, dictionaries and your favorite reads before sleep), 5-more for books you will not pick twice in a year. But avoid more than 10, except you're seriously running out of space like I do. 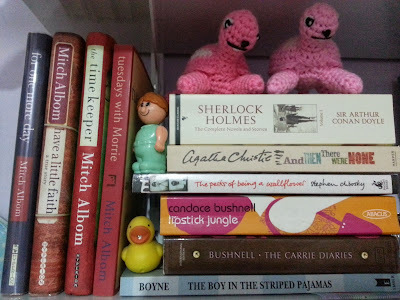 My English-written novels are placed on the highest two level of my shelves. I categorized them by the author's last name. As I've told you....I'm running out of space. So I got really got no choice if I break the rules I made. Ha! So you can see on the second shelf, I put a stack of my Garfield comics. Below the second shelf, I put all my Indonesian-written ones. 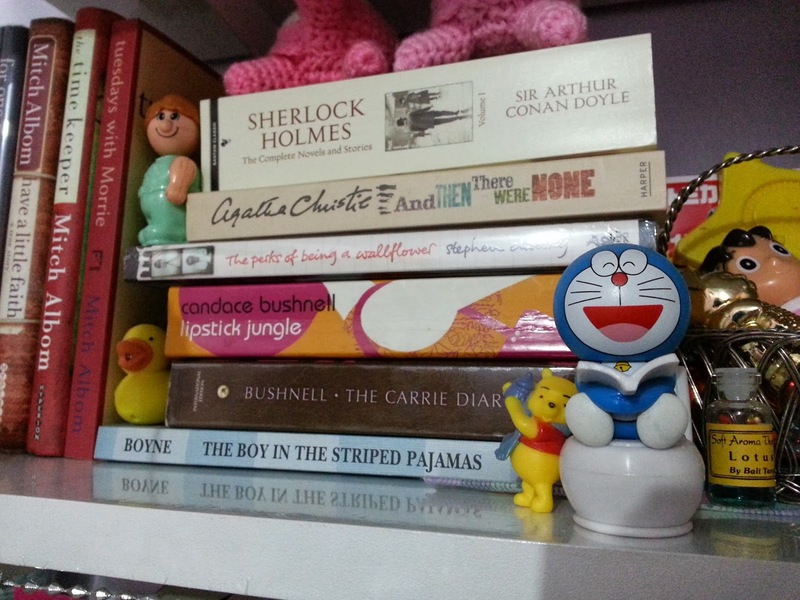 From novels, short-story collection, biographies, and all. There are lots of them until I have to make two rows, inside and outside. 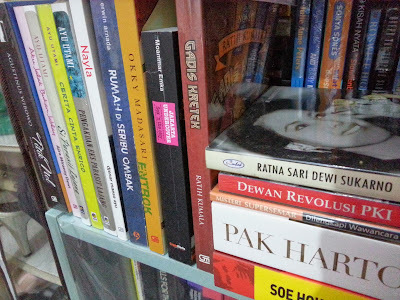 I put Indonesian books I also have in English at the back. Or, they are less of my favorite. The cutest stuff? I'm a big fan of animal stuff. Other than animals, I love Power Puff Girls, Smurfs and .... I got too many. Can't list down that quickly. I'm obsessed with diversity, where anyone can be friends. As I'm friending with stuffed animals or real animals, etc. 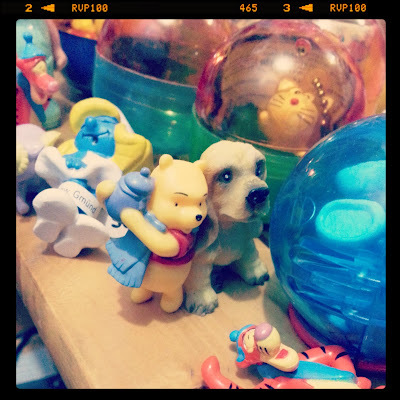 You might call me crazy but I think if my cutest stuffs can talk to each other when I'm not around (sounded like in Toy Story? ), I want them to be around each other. No matter if they're celebrity (in this case, I mean, they're TV show, comic, anime/manga or film characters) and, let's say, commoner (cute creatures but nameless, so I gave them names). 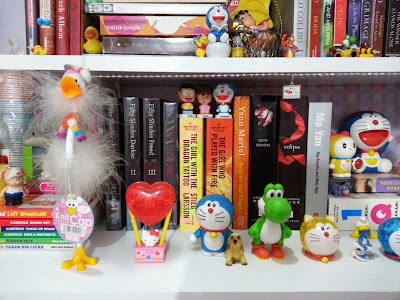 I'm showing my OCD problem so much on how I arrange the bookshelf, although it seems rather fail due to lack of space, so I decide that my cutest stuff should be be happier than their previous spots and can be anywhere they can be. 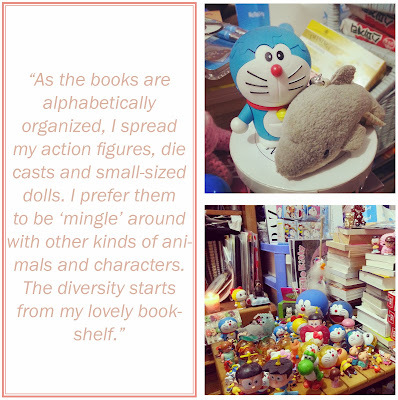 As the books are alphabetically organized, I spread my action figures, die casts and small-sized dolls. I prefer them to be 'mingle' around with other kinds of animals and characters. 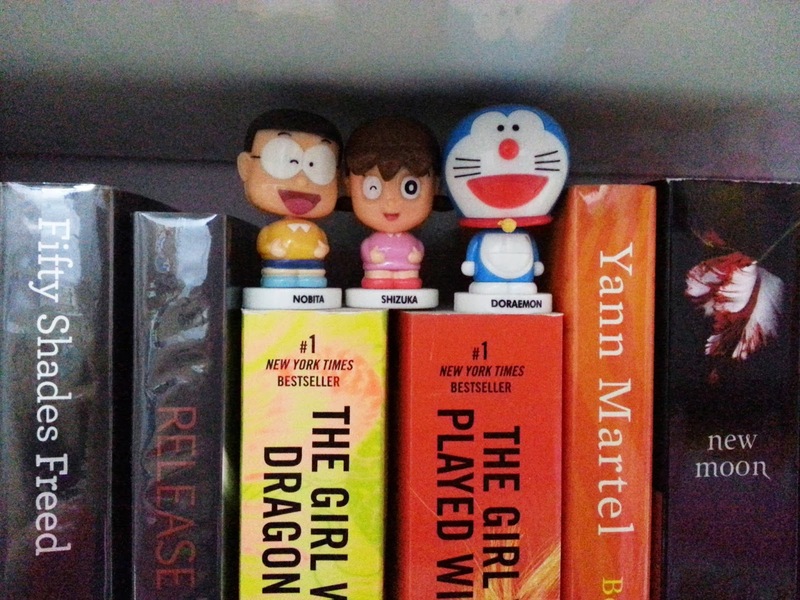 The diversity starts from my lovely bookshelf. Make peace, guys! You know what doggy, I'm going to share my hunny to you! To be honest with you, I still have a pile of books that I categorized as "hidden women stories", which are about mistresses, call girls and such. Also, I got reference books somewhere else separated, well arranged with my Despicable Me minions action figures. My children books team up the Classics and some books. Manga books, travel books got to share one shelf with biography and autobiography. The comic books rule one shelf. And... I still don't have any more space to place my portfolio magazines and Doraemon characters action figures I got as my Christmas present last year. The only solution is... buy or build more shelves. Not perfect, I know. At least, it's more tidy. Cheer up with your fave smiling friends! Maybe I also have to lose some good angles in my previous arrangement. But yeah, moving on is always important for fresh journey ahead. 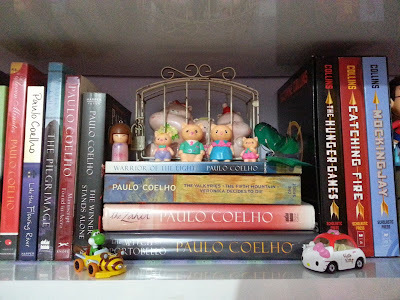 For more shelf ideas, you can check my Pinterest for more inspiration in my Shelf Ideas board. I have collected some great pics for you to be inspired. And Home Decor board for more decor ideas surrounding your bookshelf.